Padma Talwalkar, born in Pune on 28 February, 1949, into a family of kirtankars, is a veteran vocalist and teacher of Hindutani raag-sangeet. She is the granddaughter of the famous kirtankar, Kanebua. Padmatai’s formal taleem began at the age of ten, when she became a pupil of Gangadharbuva Pimpalkhare of the Gwalior and Kirana traditions of music. Later from 1969 to 1974, she learnt under the legendary Mogubai Kurdikar. During this period, she was also greatly influenced by Kishori Amonkar and she accompanied Kishoritai in several concerts and this gave her an insight into the art of concert singing. She then underwent rigorous training under Gajananrao Joshi, a stalwart of the Gwalior, Jaipur, and Agra gharanas. She has also received invaluable guidance from Nivruttibua Sarnaik, another stalwart of the Jaipur gharana. Padmatai’s music is a balanced blend of Jaipur, Gwalior and Kirana gharanas. Her music, which combines bhaav with technical brilliance, is devoid of gimmickry and acrobatics, and showcases the raga in its true form. In her music it can be seen that Sur and Laya are interwoven to create very aesthetically and intellectually pleasing patterns, without any harm being done to the raga grammar. Padmatai is a dedicated and committed Guru and has been actively involved in passing the treasure of her knowledge to the next generation. Her list of disciples includes Gauri Pathare, Manu Srivastava, Shalmalee Joshi, Saylee Talwaklar, Yashaswi Sirpotdar, Ankita Deole, among many others. Five year scholarship from the Bhulabhai Memorial Trust. Two year Kesarbai Kerkar fellowship from the National Center for the Performing Arts. Pandit Jasraj Gaurav Puraskar in 2004. Vatsalabai Bhimsen Joshi award in 2009. Sangeet Natak Akademi Award 2016. Her albums – ‘Flights of Melody’, ‘Healing Mantras’, ‘Bandish’ series – have gained wide recognition in the country as well as abroad. Padmatai has emerged as a major presence in the community of performing artists. She is a recognized All India Radio and Doordarshan artiste. 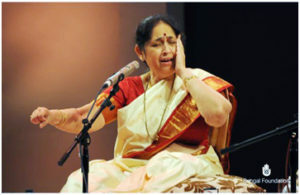 She has performed at all major music concerts in India, such as Doverlane Conference, Kolkatta, Sawai Gandharva Mahotsav, Pune, Tansen Sangit Samaroh, Gwalior,and Elephanta Festival, Mumbai.